This Satin Nickel Deck Mount Clawfoot Tub Faucet w hand shower w Drain Supplies Stops CC1152T8system is completely ready to install in your bathroom today. This package contains everything you need to get your clawfoot tub up and running. Using our 40+ years experience in the plumbing industry we have put together these packages to simplify the buying process. Take the guess work out of finding all the compatible parts on your own and let us help! Make things EASY and purchase this ready to install package. Please note, although the finish of the items in the pictures may vary slightly, in actuality they will match each other perfectly! In this kit the Clawfoot Tub Faucet mounts directly to your tub. However, the faucet itself does not directly connect to the hot and cold water lines. The water lines come up out of your floor and connect to the included Satin Nickel finish supply lines. The supply lines feed hot and cold water into the faucet which mixes the water to your preferred temperature. This warm water then comes out the spout and fills the tub. The supply stops at the bottom are emergency shut-off valves which all faucets require. The decorative Clawfoot Drain allows you to plug the drain so you can fill the tub. It also prevents the water from overflowing. All items are finished to match since with a clawfoot tub the hardware is all exposed and you want it to look nice! Satin Nickel Deck Mount Clawfoot Tub Faucet w hand shower w Drain Supplies Stops: This Clawfoot Tub Faucet, Drain, Supply Lines, Stops is built to last. The highest quality standards are used to precision manufacturer a top of the line product. Important features of this BRAND NEW Fixture: Complete Item! Everything necessary for installation is included. 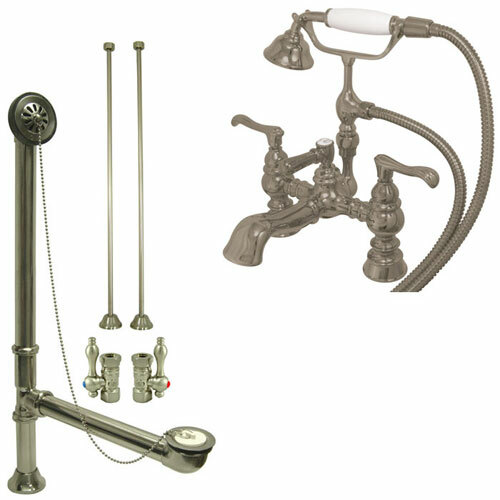 Solid Metal Lever Handle - Deck Mount Clawfoot Tub Faucet w hand shower - Solid Brass Construction - Deck Mount Clawfoot Tub Filler - 1/4 Turn Ceramic Disk Cartridge - 7-inch Spread - Spout Height 2-inch - Spout Reach 6-inch - Satin Nickel premier finish designed to resist fading and tarnishing. This fixture is manufactured by Kingston Brass and is part of their Precision Manufactured collection. Have questions? Read more about How this Clawfoot Tub Fixture Package works!